The first question you need to honestly ask yourself while contemplating making your content available only to paid readers. Is your content really worth it? Many people who start out in business tend to have very optimistic expectations with regard to their business prospects. Optimism is good in small doses, but pragmatism and the critical judgement often keep businesses in the game for a prolonged duration of time. The best companies have a healthy dose optimism tempered by pragmatism. Google would be an excellent example. They constantly invest in outlandish technologies (optimism) and yet 96% of their revenue is attributed to advertising as of 2011. They have the wealth and resources that would allow them to afford a few sizable financial hiccups. If you are starting out as a first time blogger, you may not have the financial resources to learn from mistakes. Let’s make sure you do not make any! Will People Pay For Your Content? This is the most basic and yet the most important of questions you’ll need to ask yourself. And it is very easy to arrive at an “Easy Yes”. Dealing with this tricky, yet highly important question the right way is paramount. Can you find the exact same content you are selling to your readers for free anywhere on the internet? If the answer is yes, stop here you will never be able to sell your content for money. If anyone can get something for free, there is no incentive to purchase it (assuming no temporal advantages). Do you have any credibility in this particular field that you are offering information on? Do you already have a blog or a website which you been running for years providing specific information on certain topics? Do you have advanced degrees in the particular field or a related fields? On a mostly basis, how many people visit your website? Anything that adds credibility is very relevant to the discussion. Is it the right time? Adding costs for viewing content will affect how effectively you can scale your business. If you’ve reached a critical mass of audience or if the costs of acquiring new patrons has diminishing returns and if growth is slowing down because you’re at or near the top of your niche/industry, in terms of market share, then it’s a good time to create premium content. Does the information you intend to sell have any insightful or actionable knowledge? Content that offers little to no benefit in terms of financial/emotional enrichment tend to have a hard time in the market. Follow the money, it very rarely leads you astray. You can judge how valuable your niche is or how much competition there is in your niche, if you understand how keyword research works. I could write about keyword research here, but the topic is vast and deserves discussion at great depth – I’d recommend you check out Moz’s guide for keyword research. If you can not figure a way to tie market value into the equation, it’s going to be very hard to get your business profitable. Without a number, an answer to any of the aforementioned questions is just wild conjecture which will not aid you. Successful businesses makes money, optimizing your income should be your objective. You’ll need to know how making content available only to paid users affects your income and reach. It all comes down to the size of the pie to be had in any niche, the competitiveness of said niche, your ability to provide a great value proposition to audiences and making trade-offs between scaling business & producing better income margins. How Do Web Businesses Make Money? Now when I talk off selling content and creating premium content, I’m referring to businesses that rely solely or in large part on selling stuff to a market. Essentially most web businesses operate through one of the four channels to generate income. For example, take WPExplorer – why does WPExplorer hire writers to create content, only to not sell that content? First reason – We aren’t the only source for WP news. We have some pretty awesome content on our website to help online businesses that use WordPress. We have great content on a spectrum of topics which includes marketing, search engine optimization, hosting and pretty much every other aspect of running a successful business through WP powered websites. Second Reason – Good content on our blog translates to great marketing. Remember I talked about building credibility, it adds greatly to our credibility. Making content available only to paid readers would get in the way. Third Reason – The primary business here for WPExplorer is selling themes, not content. WPExplorer is a themehouse that produces awesome themes which have sold over 35,000+ copies in the past few years. And apart from selling themes, we also use affiliate marketing to add a little to our income. Again, creating premium content is not compatible with our sources of income, it would just get in the way. Most websites that sell their content are able to offer something other websites can not, either timely deliverance of news or insightful opinions and articles you aren’t going to find anywhere else. This is also why so many newspapers and magazines online use a subscription model for generating revenue. How Do You Sell Premium Content? If you are selling an eBook that’s very different when compared to the sort of stuff we’re talking about here. In the case I’m describing, we’re talking about a business that generates great fresh content on a daily/weekly basis. So even if a website doesn’t make money through advertising and acts neither as an affiliate nor a seller of services, it can to sell content produced on a timely manner to make money. 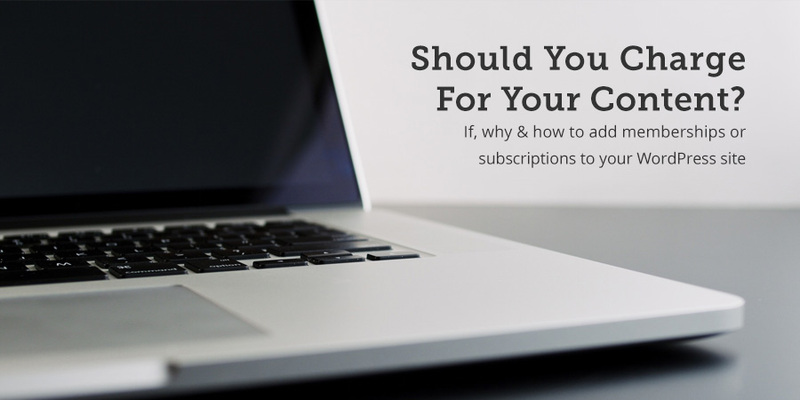 A subscription modeled is geared towards producing great content and then, there is very little interaction between provider and reader. This is the model of choice for most premium magazines and newspapers like The New Yorker or WSJ. A membership model is apt for web businesses that go beyond providing content, for websites that have an active member base who are also receivers of a service or a product that the web business provides. Included in the same membership may be access to content exclusive for members only. We’ve been discussing selling your content and the intent is not to push a product or sell a service. So we’re talking about subscribers, not members. We need to build a subscriber base. Websites tend to have large audiences but only a small percentage of them are subscribers and that percentage drops even more for paid subscribers. This might get a bit complicated, so I’ll keep it simple. There are a few ways to go about doing it. But the best way would be. Growth is more important than monetization. Can you imagine trying to sell content on a brand new website with a domain that has little to no traffic? Unless you are a celebrity, it will not work. So you do have to reveal some content. But how much? Use an approach that provides each reader with a specific number of articles per month. This is a good idea, if you produce a lot of content on a monthly basis. Show your audience a detailed excerpt from the article or snippets from the article that makes outrageous claims. Entice your audience into buying the content. This must certainly remind you of how software developers operate, they show you a sufficient number of functions to entice you into purchasing the premium version of the software. The proposition here is very similar, show your audience just enough to get them to pay for the rest. Also I must point out here that you’ll need to figure out how this will affect your Search Engine Optimization. If your website relies on search engines for traffic as most websites do, blocking access to your content when search engine crawlers come for a peek, can send your site’s search engine rankings into a nosedive. Restrict Content Pro is one of the best ways to monetize your content. There are easy to use features for creating and managing your subscription or membership levels, and options to restrict specific posts, page or pieces of content. MemberPress is another great plugin option that integrates more membership options, reporting tools and the option to sell sell digital goods as well as premium content. MemberMouse is another awesome and powerful plugin that you can use to sell memberships, subscriptions and products. With added features for customer management, mailing lists, members only areas, support automation, reporting and more it’s a powerful tool for selling premium content. Optin Monster is by far one of the best known optin services on the web. With tons of options for forms, layouts, colors, exit intent, A/B split testing and tons of reports it’s a great investment for any business. Bloom by Elegant Themes is another popular option, since it comes with easy features, responsive designs, and customization options plus it comes from such a well know brand. Popup Pro by WPMU is a clean and simple optin plugin. Just use the templates and easy options for colors, animations and more to promote your newsletter or offers to your readers.